The two Krag machines for the application of postmarks, in function until august 1917 in tsaristic Riga, were used further. One machine was in good condition for further use, but the other had to be repaired. The first machine – “A”- was into operation in April 1920. The use of the old machines, 1920-1929, is to recognize in the postmarks: the month in Roman numerals. 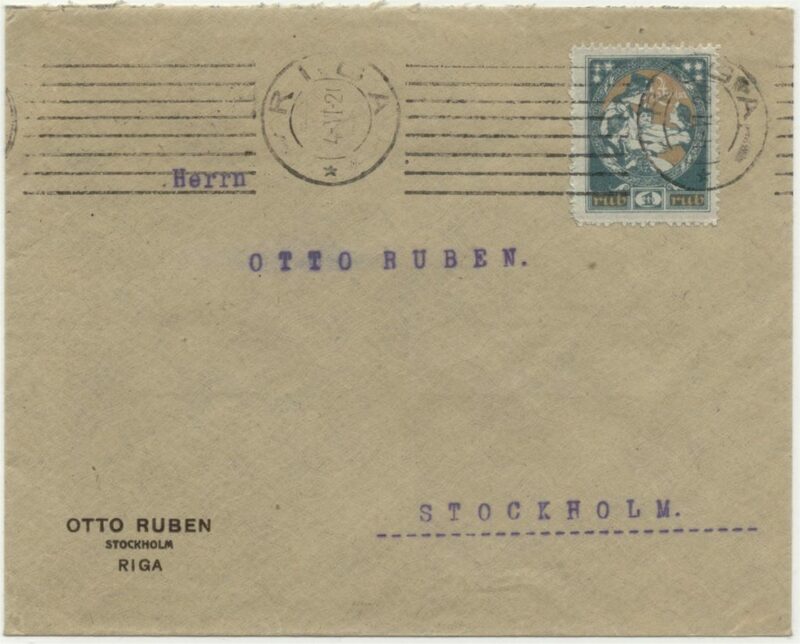 Here the first machine cancellation on a cover to Stockholm. 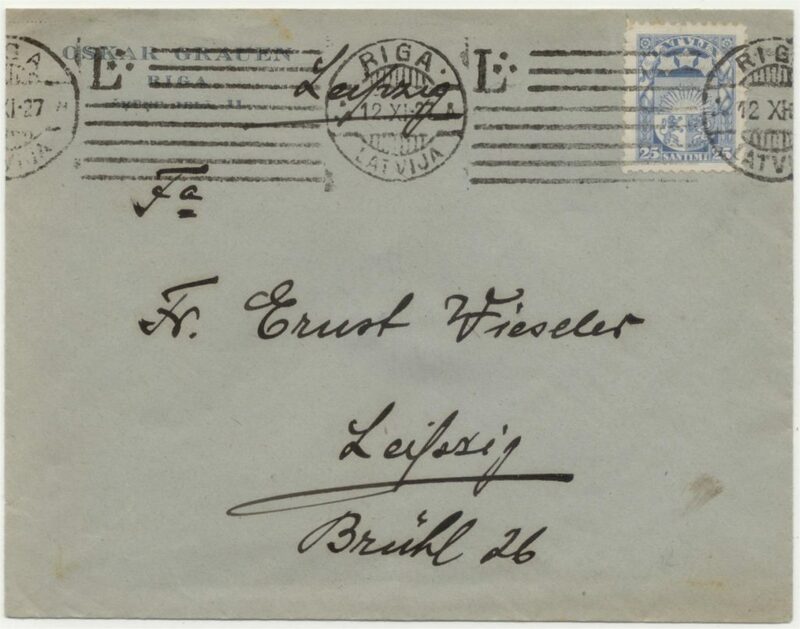 The rate was 1 Latvian rouble between 1-4-1920 and 1-8-1920 for an international letter. Then 2 Latvian roubles between 1-8-1920 and 1-2-1921. On 1-2-1921 it raised to 5 Latvian roubles and 16-5-1921 the rate became 10 Latvian roubles. 1-1-1922 it raised again: 15 Latvian roubles. The postage stamp: 1 rublis. The date cannot be 4-VI-21. Good looking (and increase with the computer): 4-VI-20 with the correct rate. The postage stamp is Mi. 41, issued March 24, 1920: the Latgale liberation issue, Mother Latvia with two of her children, Vidzeme and Kurzeme, welcomes Latgale, the third child. Not to see on the cover, but the stamps are printed on the back of half sheets of the Bermont 10 Mark notes. About these postage stamps see: The postal and monetary history Latvia / N. Jakimovs en V. Marcilger. – 1991. – p. 3-48/49. The datestamp is an one-circular postmark with date vertical without serial letter, 8 lines 45-48 mm. In the tables of von Hofmann and Juris Mors this is M-01-A. This postmark was used 21-III-20 (first reported date) and 14-VIII-22 (last date). The postmark has no serial letter, but we have to do with the first machine A, the only into operation at that time.The other machine was in operation a year later. The country name is not indicated in this datestamp. This postmark is used for incoming and outgoing mail. 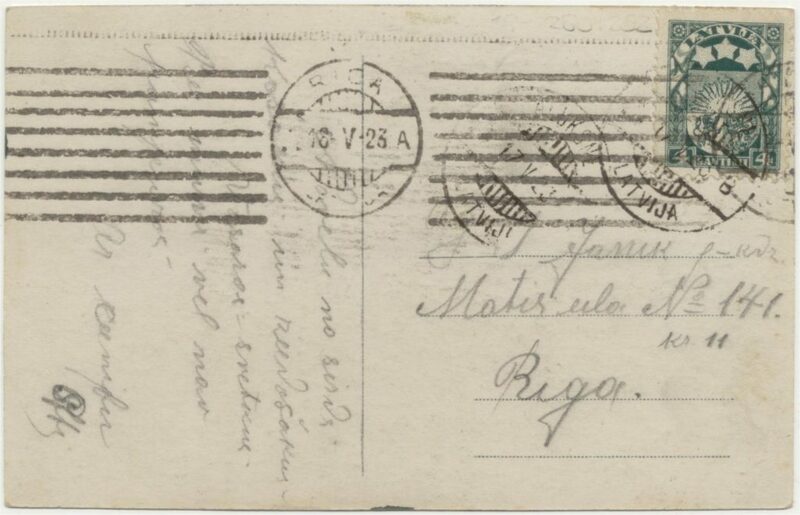 From October 1, 1922 we see -as on this card below- postmarks with serial letter ‘A’. In the tables this is M-02-A. The machine cancellation of this card above has a ‘bridge’ type circular date stamp with 7 segment bars and serial letter A. This datestamp -and the folowing of machine A – has the country name in the new orthography: LATVIJA. The first reported date is -1-X-22 and the last date is 19-II-24 as a arrival postmark with 8 lines. According Juris Mors also seen on outgoing mail. 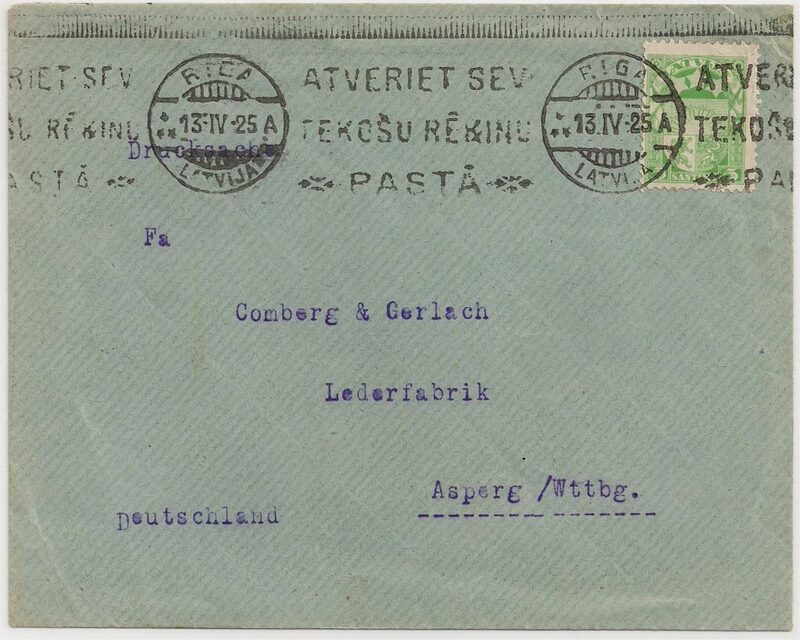 On the cover above the machine cancellation has no killer-lines, but the text ATVERIET SEV TEKOŠU REKINU PASTA (Establish a postal checking account): from -8-III-24 (first reported date) upto 22-X-26 (last date). In the tables of von Hofmann and Juris Mors this cancellation has the number M-03-A . The letters and cards were transported -upside down – along a metal trench, pushed by an milled (serrated) cylinder. Sometimes this cylinder get also some inkt and that caused the milled sign on the upper edge as you see on this cover. In the tables the machine cancellation on the letter above is M-04-A. First reported date is 25-VII-27 and the laste date is 18-VII-28. The flag has 8 lines with L and 3 stars, as we see here.